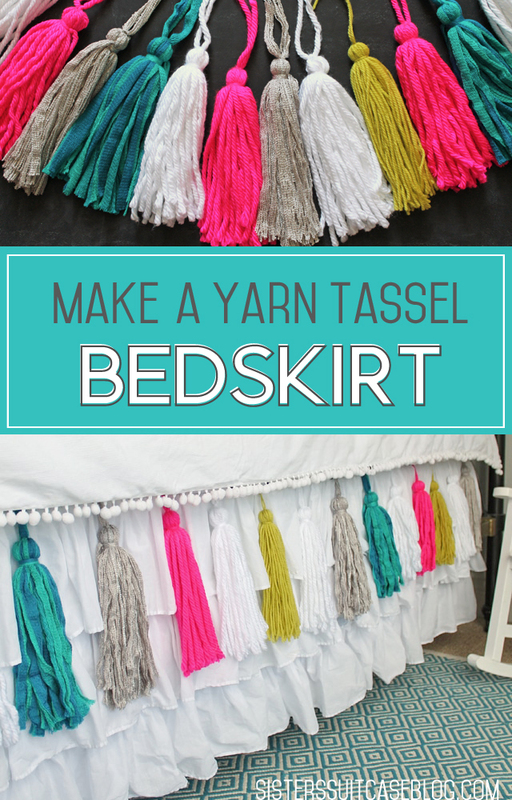 How to make yarn tassels and add them to a plain white bed skirt to make it one of a kind! 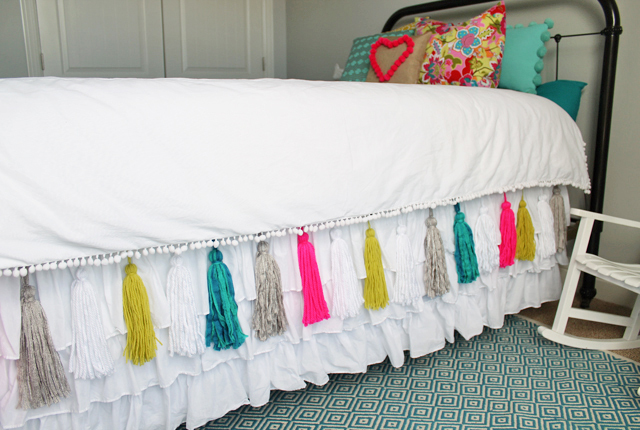 This DIY Yarn Tassel bedding makes a statement in any girls room makeover. 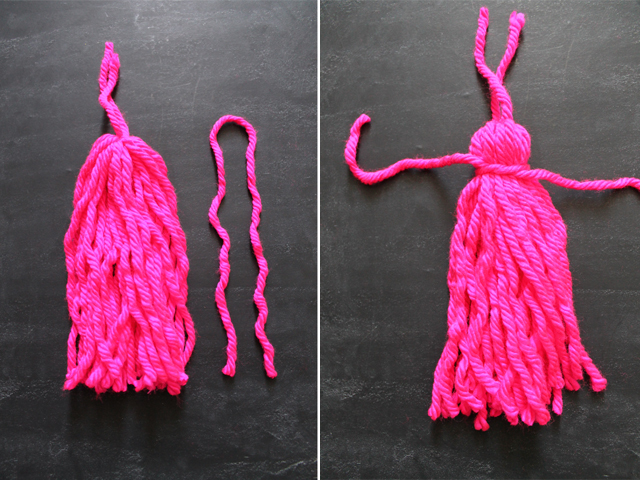 When I first discovered tissue tassels a few years ago, I made them for parties, holiday decor, and even created a tissue tassel mobile for my baby girl’s nursery. 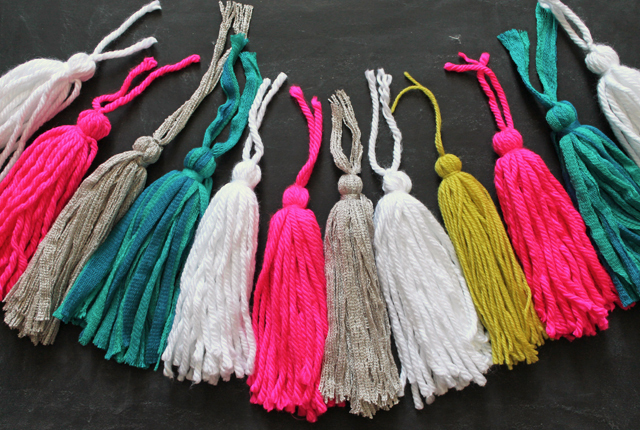 The downside of the tissue paper tassels is that they can get torn or smashed easily. 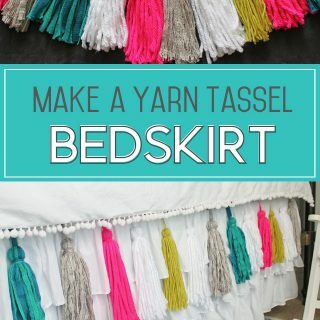 I wanted to incorporate them in my toddler’s bedroom but I knew she would ruin the the tissue ones so I went with YARN tassels instead! 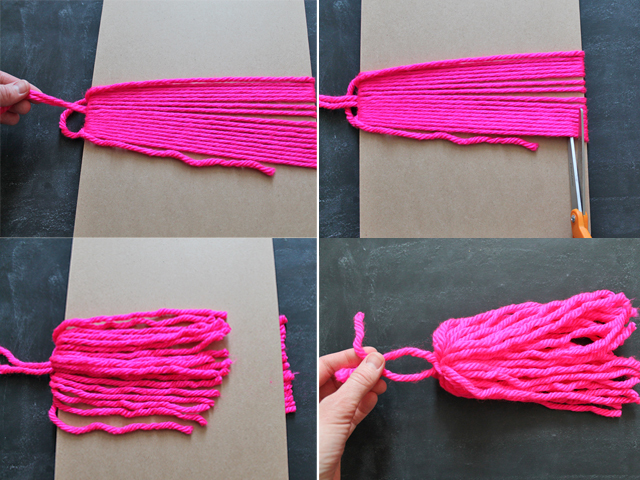 The process for making a yarn tassel is so easy! 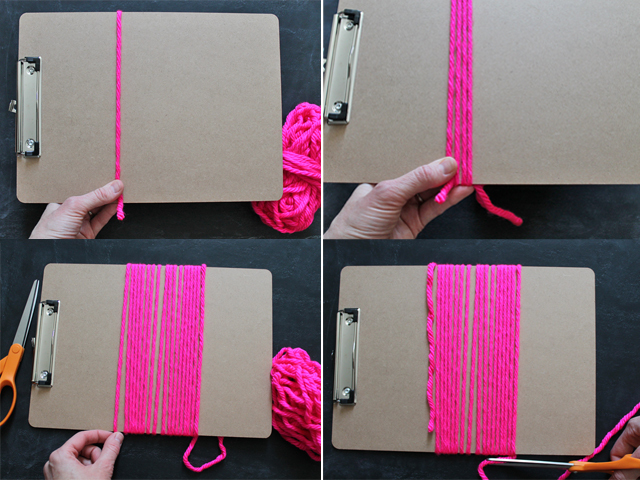 It is a perfect thing to do while you’re watching a movie or catching up on Netflix. It is really cute, but I wanted to add some color since her comforter is also white. 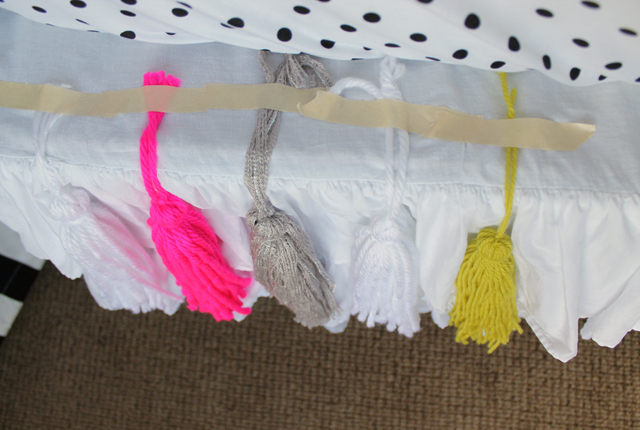 I decided to add my tassels at the top of the bedskirt for a few reasons… First, it was really easy to attach them and they are not permanently sewed on, so I can still take them off and wash the bedskirt easily. 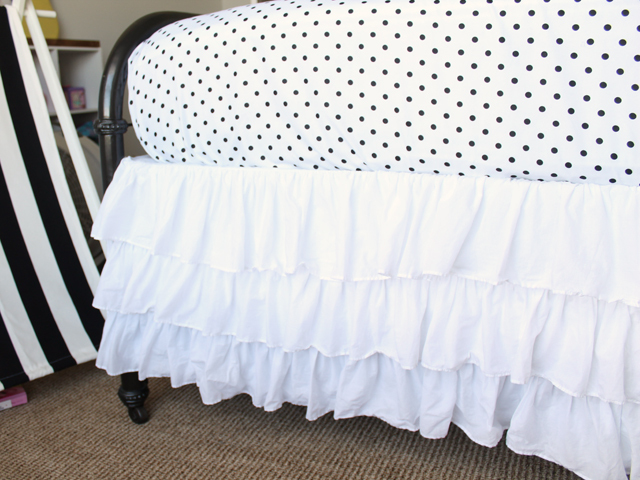 I used regular masking tape to attach them to the part of the bed skirt that’s hidden by the mattress. Anna loves the new “icing” on her bed! You can check out some other projects in her room here. 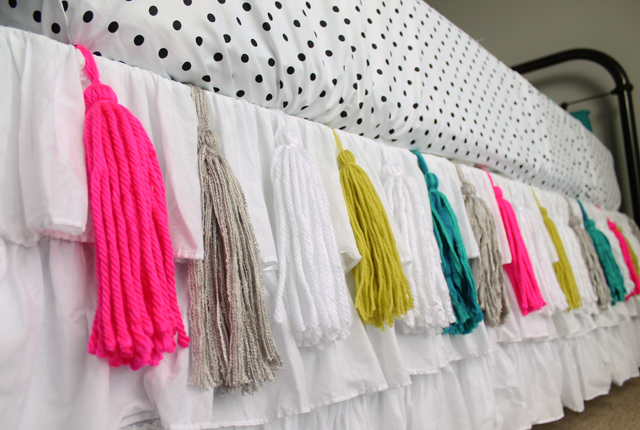 i love these pops of color…and my cat would think these tassles are for them! So cute! I hope you guys link it up to our party!!! 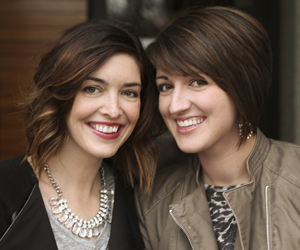 Featuring you ladies tomorrow! Can you share where the cute pillows are from? I’m looking for accent pillows for our guest room in these colors!! Thank you! 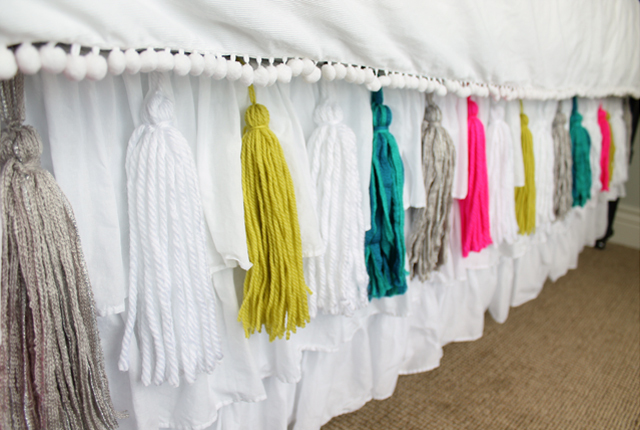 Love the tassels– if I have time this summer I will attempt my own!! Thanks Jessica! I made the bright floral pillow with fabric I got at JoAnn Fabric Store a few years ago 🙂 The blue pom pom pillow is Pottery Barn kids, but I got it at DownEast Home here in Idaho Falls. 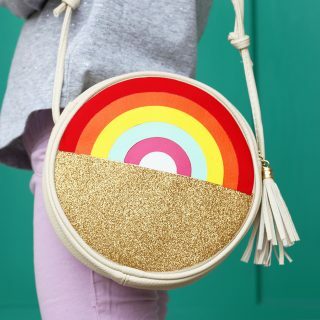 I made the other pom pom heart pillow, the tutorial is here: https://sisterssuitcaseblog.com/2014/01/5-friday-heart-pom-pom-pillow.html. Target is one of my favorite places to find pillows too! Hello! 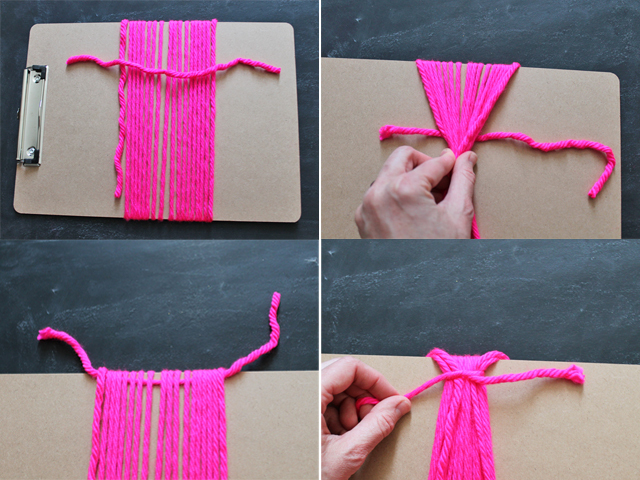 I love this idea and I am going to try it out! Where is your daughters comforter front! 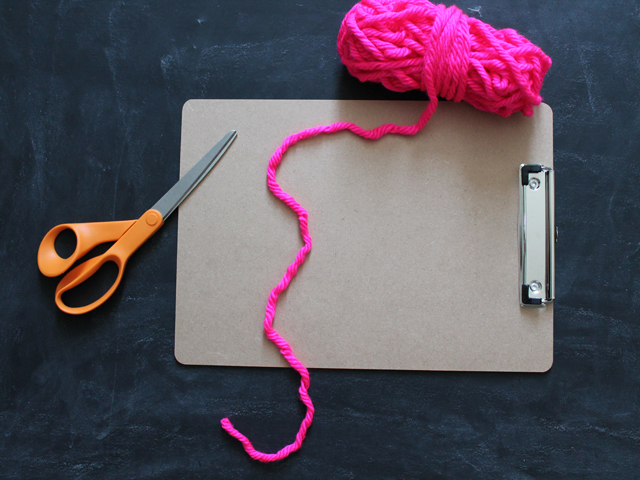 I love the small pom Pom balls on the end!